Durban - Chad le Clos and Erin Gallagher posted FINA World Championships qualification times during the first day of the SA National Aquatic Championships. The 2019 SA National Aquatic Championships and FINA World Championships trials got under way at the Kings Park Aquatic Centre in Durban on Monday. 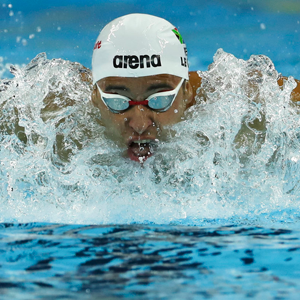 Olympian Le Clos was in top form as he cruised to the gold medal in both the 200m butterfly and the 100m freestyle, clocking a qualification time of 1:56.21 in the butterfly, but posted a modest - by his standards - 49.75 in the freestyle, 0.95 slower than the 48.80 requirement. The silver and bronze in the 200m butterfly were claimed by Ethan du Preez in 1:58.24 and Eben Vorster in 1:58.44, while Ryan Coetzee and Zane Waddell took home the second and third place in the 100m freestyle in 49.84 and 50.28, respectively. In the 100m freestyle, Gallagher's quick start won her the gold medal in a qualification time of 54.34 ahead of Aimee Canny in 56.33 and Emma Chelius in 56.43, while in the 800m freestyle, Kate Beavon walked away with the gold medal in 8:59.38, followed by Kristin Bellingan in 9:01.84 and Abi Meder in 9:03.93. Dune Coetzee narrowly missed out on a qualification time when she clocked 2:10.89 in the 200m butterfly, just 1.68 over the required 2:09.21, while Emma Christianson claimed the silver in 2:16.66 and Trinity Hearne the bronze in 2:19.92. The long-distance 1 500m freestyle title was won by Josh Dannhauser in 15.24.55, followed by Henre Louw in 15.49.32 and Righardt Muller in 15.52.56. In the 4x100m freestyle relay, KZN's Matthew Bosch, Calvin Coetzee, Daniel Ronaldson and Ryan Coetzee bagged the gold in 3:26.10 ahead of the Free State’s Vorster, Cullen Thomas, Kobus Groenewald and Gawie Nortje in 3:27.00 and the Eastern Cape's Christopher Reid, Alaric and Alard Basson and Martin Wolmarans in 3:27.13, while the Western Cape ladies' quartet of Chelius, Canny, Olivia Nel and Inge Weidemann won their respective relay in 3:48.78, followed by KZN’s Rebecca Meder, Gallagher, Kristen de Goede and Ambrin Pienaar in 3:52.22 and Tshwane's Coetzee, Lindsay McLeod, Veronique Rossouw and Marlies Ross in 3:54.05. In the multi-disability events, the 50m breaststroke (S14-15) medal podium consisted of Aaron Putz in 34.06, Grenate Haupt in 36.59 and Sandile Shezi in 38.10, while the S1-13 category gold medal went to Johann van Heerden (SB10) in 31.77, the silver to Kaleb van der Merwe (SB8) in 39.82 and the bronze to Gift Mncube (SB7) in 44.63. On the ladies' side, Michaela Kretzen, Cornelia Fowler and Mia van der Merwe topped the 50m breaststroke in 48.09, 49.46 and 1:00.91, while the S1-13 top places went to Cornelle Leach (SB12) and Melisca Everson (SB9) in 42.58 and 1:14.94, respectively. Kretzen also won the 100m backstroke in 1:23.88, with the S1-13 category gold medal going to Paula van Zyl (S10) in 1:30.43, while on the men's side, it was March Roach (S15) in 1:04.79 and Franco Smit (S12) in 1:05.25 that grabbed the backstroke gold medals. The SA National Aquatic Championships will continue on Tuesday with the heats session starting at 09:30, while the finals will begin at 17:00 daily.